The Karno-Ruthenian culture retains much of the European influence originally brought by the Imperial and Royal Family and the rulers of the states of the Empire. It places an important emphasis on family, religion, and traditions in general, such as respect for holy days. In Ruthenia, music consists mainly of traditional Hungarian folk music, especially the Csárdás, and music by prominent composers such as Béla Bartók, Vittorio Monti, Pyotr Ilyich Tchaikovsky and Georges Bizet, and also makes success the current pop songs. Other aspects of Ruthenian culture include Horse racing, Hunting (banned by the Royal Family since 2014), Masses on Sundays for the Catholics, and festivals between June and August dedicated to St. Anthony and St. John the Baptist, among others, where dancing around bonfires takes place. 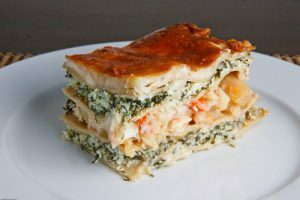 Fish Lasagna, the national dish of Libertia. The culture is also largely influenced by the Lomellinian Culture, adopting most of the Lomellinian traditions and customs as well as certain similarities with the Portuguese culture and Italian culture. These two great European influences made, especially of Libertian culture, a romantic and flattering influence in the micronational world. In Libertia, is usual for a citizen say they have three main goals: Discover, considering that since the beginning, the Libertian ancestors dedicated their lives into discovering new lands and new ways of living; so, Libertians follow their actions into discovering new ways to improve it’s citizen’s lifes. Create, the best works of art always inspired the best minds of mankind into re-writting history as we know today, Libertians create those inspiring pieces to allow tehir citizens to improve and Preserve, the world’s biggest archives helped the people understand their ancestors into improving what was already done, Libertians preserve that information, allowing the common citizen to learn more. Libertians, mainly the Grancasian people practice somekind of artform wich is one of the greater values of the duchy, the ducal family is often seen painting, composing, decorating and even writing pieces of art. Other cultures that influenced the Empire everyday are the Croatian culture brought by Horvatians and the Irish culture from Kingdom of Acrin. After the Compromise that united the Empire, these cultures began an exchange with each other, mixing tastes and habits, greatly enriched by Germanic cultural aspects brought by Karnia and Letzembourg. After the Treaty of Nison on September 2016, many French elements were observed in society and were introduced by the Cumagnaise. In everyday use, Portuguese is used by the majority of the subjects in Ruthenia, Libertia and Horvatia. In Court, the official language while still the Portuguese, the English and French has also regular use, especially by the government and it is the only language used by the Ministry of Foreign Affairs. But English is the official language after a plebiscite to decide which national language would be adopted by Ruthenia. Lusophones and Anglophones had split the Ruthenian government, disputing for power. The plebiscite ended with the victory of the supporters of the English language. With the formation of the Empire and the subsequent constitutional reform, English and Portuguese became the official languages of the micronation. The States of the Empire can edit legislation and make use of the Portuguese for their affairs, but in common subjects, only English is allowed. In some regions, French is also spoken among the population and in domestic affairs. St. Stephen of Hungary, by René Aigner. Since the founding of the Kingdom of Ruthenia, religious freedom is guaranteed by law to all subjects. This guarantee was reassured in the Ruthenian Constitution of 2015 and in the Imperial Constitution of 2016. Due to cultural and social diversity of the Empire, the Roman Catholicism is predominant and is even the official religion of the Empire, according to the constitution. But the Unitarianism, Deism and Eastern Orthodoxy still enjoy official status. 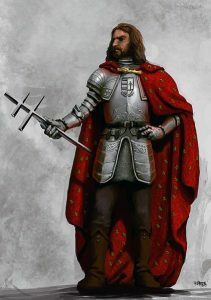 The Patron Saint of the Empire is St. Stephen, King of Hungary, also the patron saint of the Imperial and Royal Family. His cult acquire more strength when genealogical studies showed a kinship between the Imperial and Royal Family with King Ladislaus I of Hungary through Mary of Hungary, wife of Iaroslav Sviatopolchich of Volhinia and also a distant relative of St. Stephen. St. Stephen’s feast is observed on 16 August, one of the most important holidays of the Empire. In Karnia, the patron saint is St. Adalbert of Prague and in Libertia, Leonardo da Vinci was made a kind of “patron saint”, an example to be followed in the duchy which is Deist.